Our programming at University of Wyoming was the most expansive we’ve done to date, becoming one of our most memorable trips. 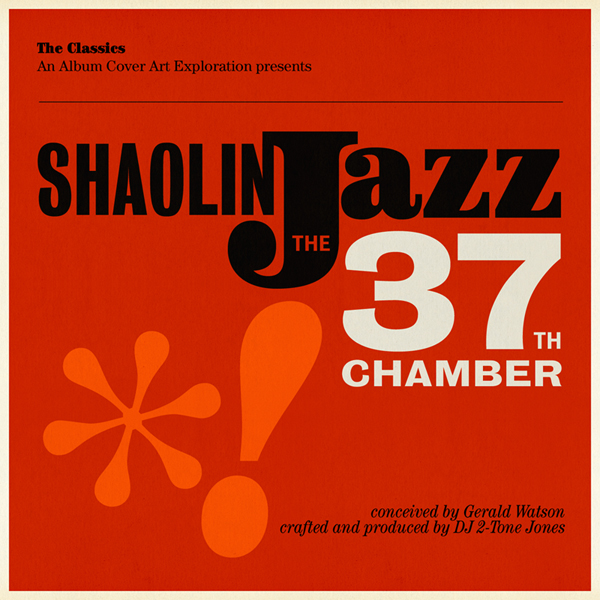 Our two day stint at the school consisted of a panel discussion and SHAOLIN JAZZ L!VE (featuring DJ 2-Tone Jones and Sound of the City) – day one, and a classroom lecture and COLOR of SOUND (which included student artwork) – day two. Despite a lot of moving parts (production, personnel, etc) each event ran pretty smoothly, received good attendance followed up by fully engaged attendees; making for a great experience. Thanks to Michael Lange and Kayla Luneman (SAC), Ashley Dallum (234 Gallery), Rodney Garnett, Ulrich Adelt, and Rex Amend (panelists), and Sound of the City (Biscuit, Chooki, Solomon, and Vohn). 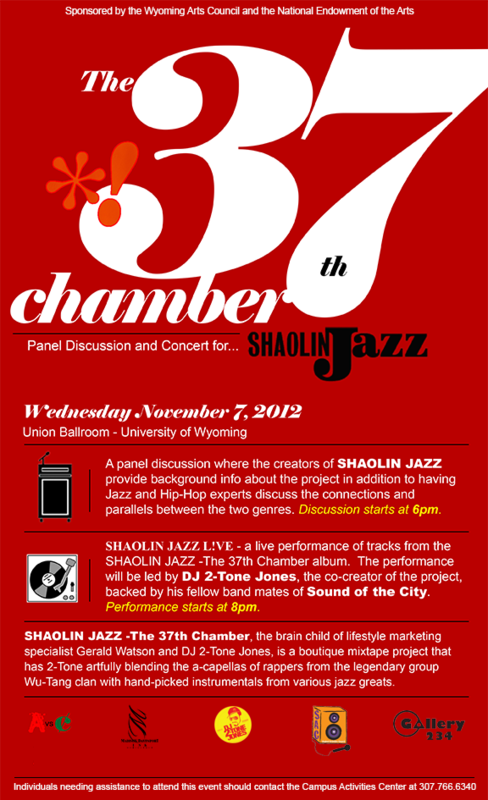 University of Wyoming is up next and we’ll have the very fortunate pleasure of spending two days on their campus with programming that will consist of a panel discussion and live concert (SHAOLIN JAZZ L!VE), which will include Sound of the City backing 2-Tone on Wednesday November 7th and another edition of our COLOR of SOUND art exhibition, which, in addition to our work, will include work from various UYWO students. Thanks to the Wyoming Arts Council and the National Endowment for the Arts, Michael Lange, Kayla Luneman, and Ashley Rama Dallum for coordinating the events. 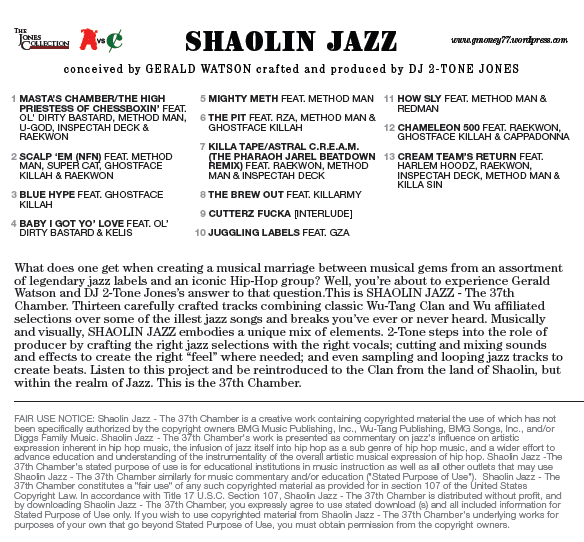 DJ 2-Tone Jones and I are pleased to announce that the next series of our SHAOLIN JAZZ – College Lectures is on the horizon starting with Berea College (Berea, KY) – Thursday October 25th. About two weeks later (November 7-8) our next college talk will take place at University of Wyoming, where we’ll be conducting a two day series of programming, which will include various speaking engagements, live performances, and more. 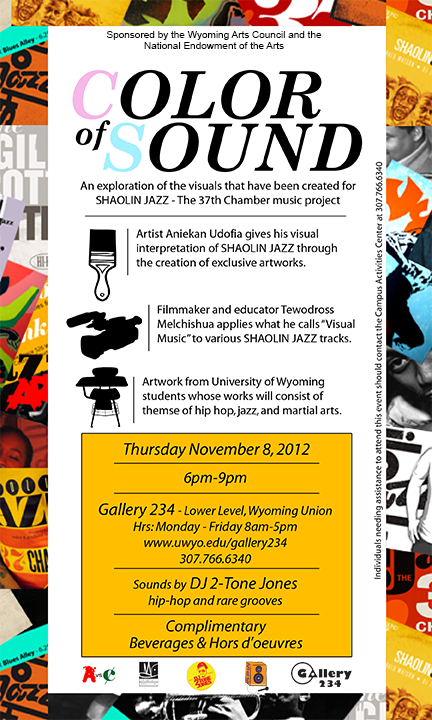 In addition to these events we’ll also be presenting the second edition of our COLOR of SOUND art exhibition and we’re reaching out to the art and graphic design students of University of Wyoming to see if they’d be interested exhibiting work.